Email and messages have grown to be our primary means of communication in the professional context and beyond. Computers and hand-held mobile devices offer excellent assistance with spelling, grammar, and fact checking. These devices and access to language support can be extremely helpful for both international students and expatriate professionals who often write in their non-native language. We need to recognize that professionalism and cultural adaptation are as important in our virtual communication as in our in-person interaction. 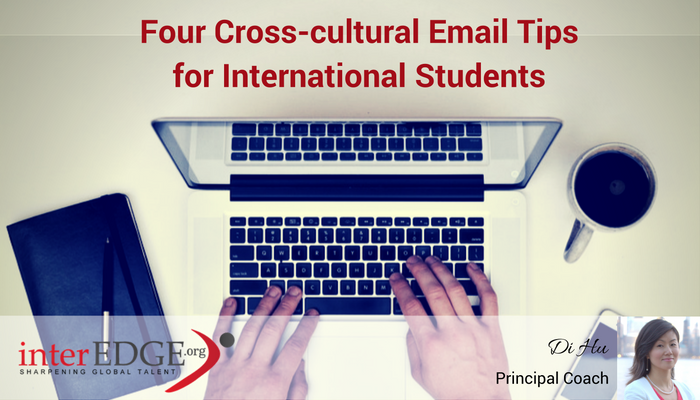 I want to share four cross-cultural email tips with international students and expatriate professionals. Regardless of the topic, there are many ways to write an email. One of the most powerful differentiators among versions is the level of formality. One should be mindful of the appropriate level for the particular culture of the addressee. Also, take note of the cultural environment in which the professional conversations take place. In cultures such as China, India, South Korea, and Saudi Arabia, where the society construct is hierarchical in nature, titles or prefixes are often added to the name to show respect. In comparison, in many equalitarian countries such as the US, Canada, and many European countries, interaction is on a first-name basis. With such, an extensive use of titles and prefixes could make them feel uncomfortable or distant. In the U.S., people often use “Dear + first name” as greetings in email communication. As you exchange more emails and become more familiar with each other, you may start using “Hi, the first name,” or even only the first name. Be careful, though, do not go to the other extreme. Avoid using “hey” as it appears too casual and disrespectful. Shorthand was only a method of rapid writing used for note-taking. The extensive use of text messages and its dominating popularity has led the rise of shorthand in our daily communication. When used in professional settings, it instantly hurts your professionalism as it carries an extremely casual communication tone. Not to mention, it may also cause confusion and questions may be likely to arise because many are not used to the “text slangs” the younger generation uses. Like many from Gen-X, you may prefer sending messages and communicating either through mobile phone applications such as What’s App, WeChat, or social media platforms such as Facebook, LinkedIn. While it is true that social networking has replaced email communication to a great extent, especially in a few countries including China and South Korea, the majority of American professionals still use emails for professional purposes. After all, any text function can hardly replace what an email system offers. Even if you initiate communication through a social media platform, many would still prefer to utilize emails within the first few messages. When you are unsure, you may ask your counterpart what would be his/her preferred mode of communication. This demonstrates your professionalism and cultural sensitivity. Your relationship with the addressee has grown beyond professional relationship to become more casual and personal. Often, the email exchanges between the two of you combine professional and personal topics. The addressee uses emoticons in his or her email. Take note that this may just be a personal preference and not applicable to all. If you are an emoticon lover, then you may mirror and reciprocate. Aside from the tips mentioned above, what are other email etiquettes you would recommend to international students and expatriate professionals? Share them with me in the comments.